Our culture (diet culture) makes food and eating so stressful! 1. Dieting is Stressful: Research suggests that dieting- restricting your eating leads to increased cortisol levels. In addition, dietary restraint- feeling like you’re constantly trying to restrict or control your eating- also leads to increased cortisol levels. That may not seem like a big deal, however increased cortisol levels can act as a chronic stressor on the body and over time impact your cardiovascular system, your metabolism and your immune system (aka not good for health). 2. Dieting increases guilt and shame: When you think about it- it makes sense. Eating “right” 100% of the time just isn’t possible. Always trying to control your eating means that whenever you don’t follow your food rules then you feel guilty. You may even say- I was so bad, I had a cookie. That guilt can easily be transformed into shame- the belief that you are bad- “I am a bad person because I had a cookie. The guilt and shame from eating isn’t innocent. It steals precious time from your life and distracts from whatever else is going on, and it also impacts your health by increasing inflammatory markers (for you science people: TNF-α, IL-1, IL-6, and cortisol) which are harmful for your health. 3. Dieting leads to decreased mental health: Over time the guilt and shame around eating can lead to increased levels of depression, anxiety, low self esteem and eating disorders. Anxiety and depression can also lead to increased cortisol levels. 4. Dieting increases body dissatisfaction. Yes, you read that right. Dieting creates increased body focus and leads to worse body image! Research suggests that body dissatisfaction also leads to increased inflammation and that body dissatisfaction itself predicts inflammatory status. Remember inflammation leads to things like heart disease, cancer, diabetes, etc. It seems counterintuitive but dieting, especially weight cycling (or yo-yo dieting- repeated weight loss followed by weight regain) is harmful to your health. 5. Dieting can lead to increased isolation and loneliness. Strong relationships are a predictor for health. When you feel like you can’t go out to eat with your family, attend social gatherings, or find food that meet your eating guidelines you may find that you stop attending events and begin to socially withdraw. This withdrawal can lead to loneliness, which leads to increased inflammation and has a negative impact on health. While short term increases in cortisol may have protective benefits (like when your body needs to fight off an infection or with the fight or flight response in the case of an emergency) long term inflammation and stress are harmful to health. Over time the stress leads to increased wear and tear on your body (called allostatic load) and leads to poorer health outcomes such as increased blood glucose levels, insulin resistance, inflammation, blood pressure, aging, reduced immune function and vascular damage. Overeating: Research suggests that the stress of eating can actually lead to loss of control with eating and turning to food for comfort. Often this loss of control with food leads to increased guilt, shame (which further increases the body’s stress response) and reinforces the need for more control around food- which leads to greater loss of control. It truly is a vicious cycle. Cognitive impairment: Research suggests the more you focus on your body and your eating, the less present you are in life. Thoughts about food and body decrease mental functioning- make it harder to recall information, lead to slower reaction times and decreased performance. These deficits in cognitive performance were closely related to dieting or the perceived need to diet. If you’ve ever felt like dieting made you less aware- then you were right. It’s a complete distraction to life. Instead of being mindfully aware time is spent ruminating on food, weight, and body shape. Decreased physical activity: increased stress from focusing on food and body can lead to decreases in physical activity, motivation to exercise and even exercise avoidance. It may seem counterintuitive but the more you stress about food and your body, the less likely you are to care for your body. Sleep deprivation: Stress from food and body can also lead to difficulty falling asleep and staying asleep which leads to sleep deprivation. Lack of sleep increases cortisol levels even more and triggers the fight or flight response- which makes it harder to fall asleep the next night. This creates a vicious cycle of sleep deprivation and increased stress. Sleep deprivation also complicates food stress by leading to loss of control with food and increased over eating. GI dysfunction: Stress from eating can also impact your GI system leading to symptoms such as gas, bloating, constipation or diarrhea. Stress and anxiety have a strong effect on digestion and sadly when digestion is effected it usually leads right back to increased stress around food and eating. Because the brain and the GI system are so interconnected it can be hard to tell which came first- the GI symptoms or the stress. 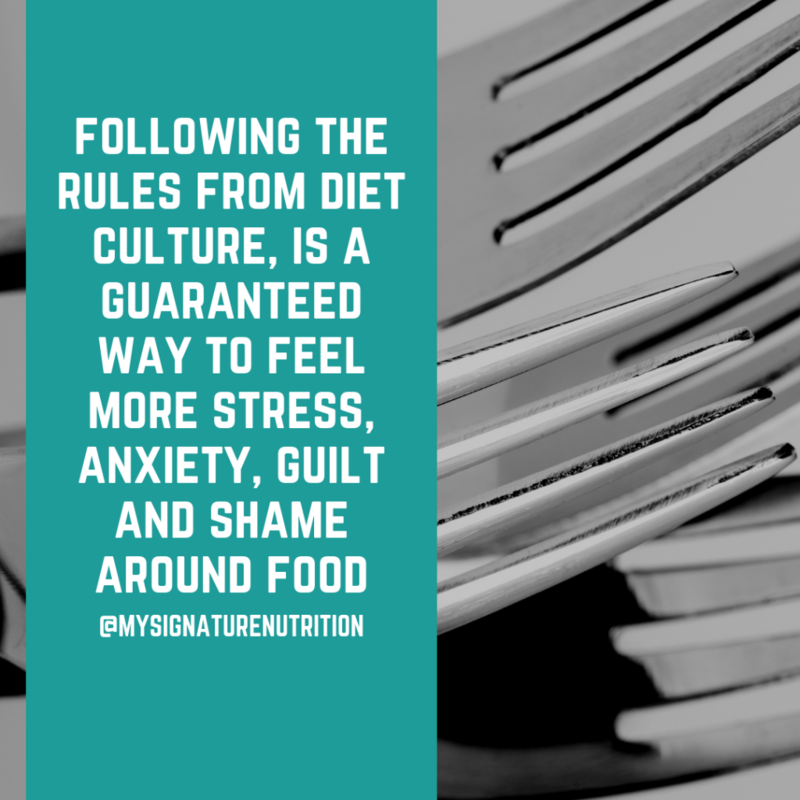 Of course, diet culture will blame food and suggest that you restrict and change your eating, which only increases stress and starts this whole cycle over. Research on GI distress suggests that mindfulness, stress management and even gut hypnotherapy are very effective tools for helping with GI issues rather than turning immediately to restriction. Another really important factor to consider with stress and eating is weight stigma. Research suggests that weight stigma (in any form- enacted, perceived, or internalized) increases stress and leads to worse health out comes including increased inflammation, overeating, shame, anxiety, depression, body image dissatisfaction, and loss of control. Weight stigma also leads to avoidance behaviors that impact health such as avoiding exercise, social isolation, and delaying seeking health care (and receiving lower quality care once there which just reinforces not going to the doctor). All of which further impact stress and lead to worse health outcomes. And to top it off- weight stigma often leads to weight gain or weight cycling, which just reinforces stress with eating and creates a vicious cycle. Weight stigma is harmful! How do you get out of this stressful eating cycle that’s negatively impacting your health? Reject diet culture. 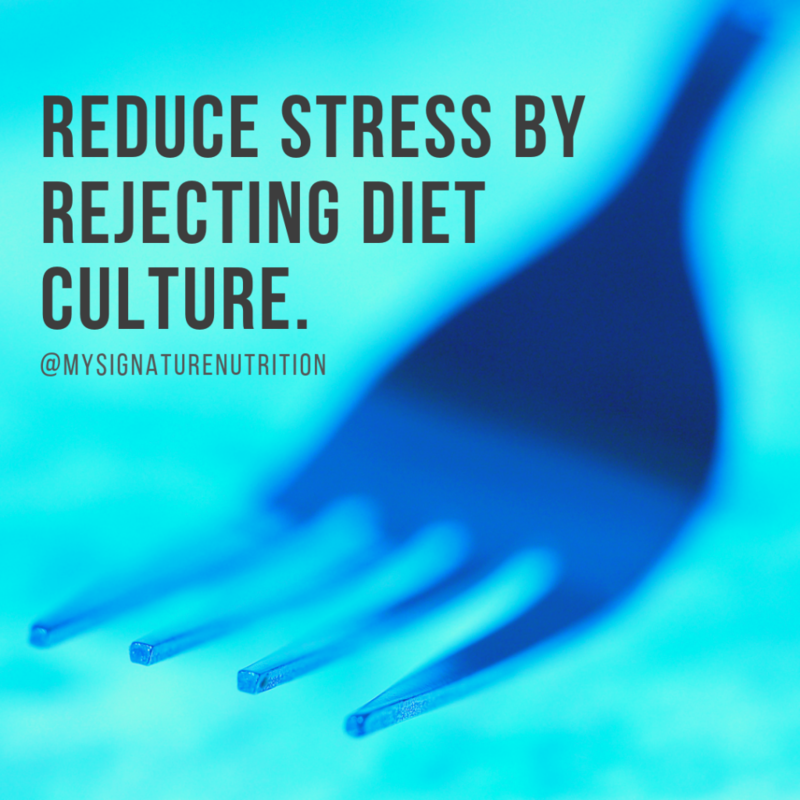 Diet culture increases stress around food. It promises that it will make eating easier and help you feel better, yet it does the exact opposite. It leads to stress, anxiety, guilt, shame and leaves you more overwhelmed and confused than ever! 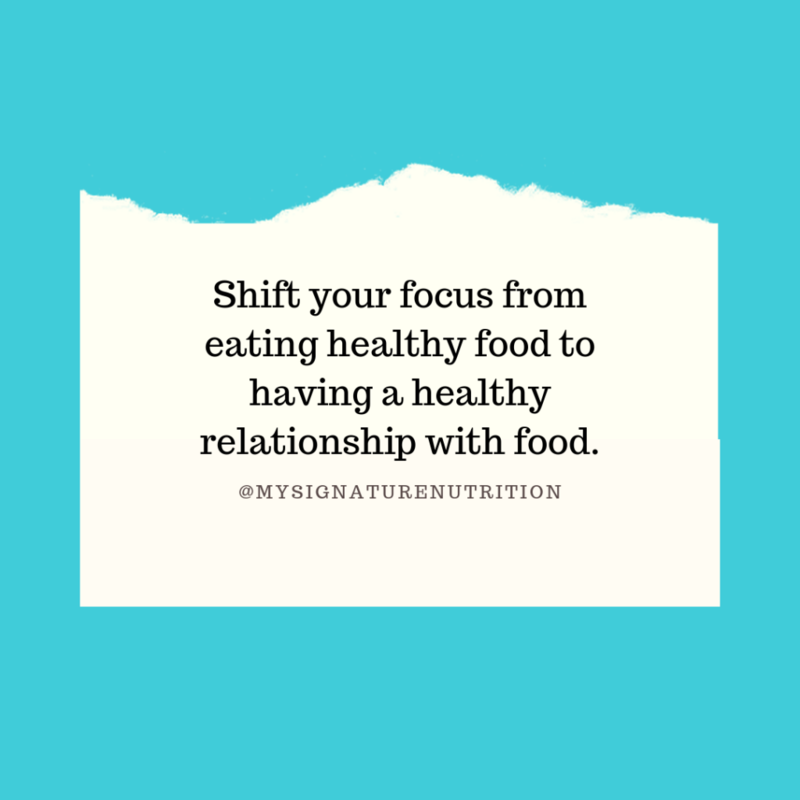 I recommend finding a weight neutral provider that can help you shift the focus from what you’re eating to why you’re eating- or to say it another way- shift your focus from eating healthy food to having a healthy relationship with food. The stress of eating is harmful and overrides any promised health benefits. Instead seek self-compassion, joy, and a nonjudgmental approach with food. You won’t believe it, but these actually help to reduce stress around eating and improve health. 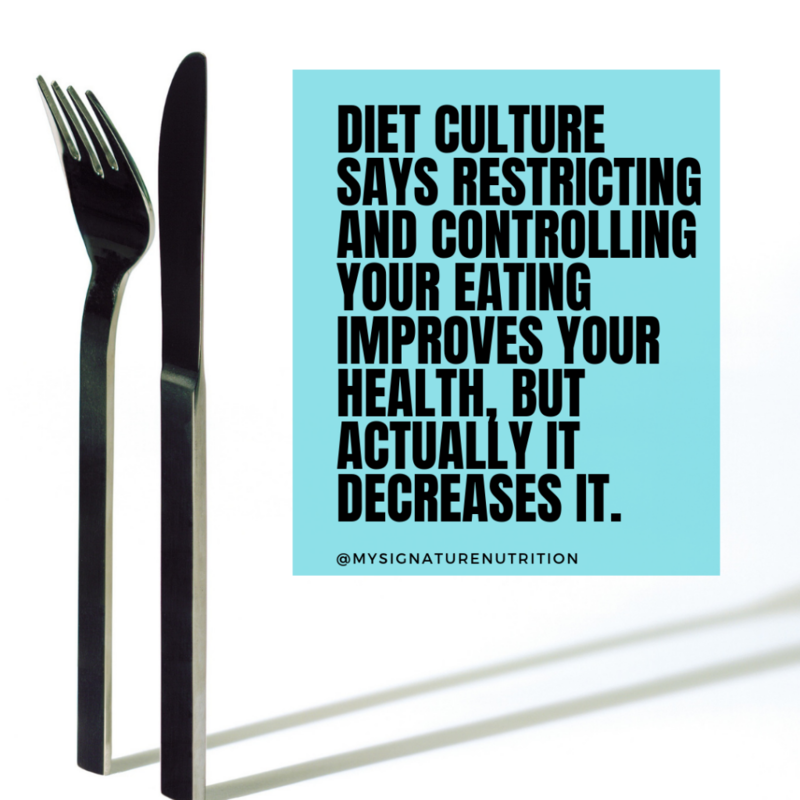 If you’d like help rejecting diet culture, check out my FREE 5 day mini course on rejecting diet culture.